These "outtakes" now appear in over 400 newspapers and websites, including the Washington Post, Toronto Globe & Mail, Detroit Free Press, Indianapolis Star, Cleveland Plain Dealer, Cincinnati Enquirer, New Orleans Times-Picayune, St. Louis Post-Dispatch, Vancouver Sun, Baltimore Sun, and Arizona Republic. In 2000, the first "Speed Bump" book was published, Speed Bump: A Collection of Cartoon Skidmarks (Andrews McMeel). More recent books include Speed Bump: Cartoons for Idea People (2004, ECW Press), which was named Humor Book of the Year by Foreword Magazine, and Just One %$#@ Speed Bump After Another (2005, ECW Press). Coverly grew up in Plainwell, Michigan, and began cartooning seriously in 1986 as an undergraduate student at Eastern Michigan University, where he penned a comic panel called "Freen" for the Eastern Echo. He also studied in England during this time, and returned to EMU to receive his bachelor's degree in both philosophy and imaginative writing in 1987. 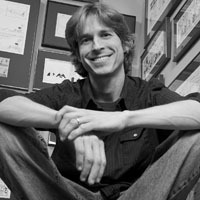 He continued his cartooning in graduate school at Indiana University, where his panel in the Indiana Daily Student won numerous national awards; he was graduated from IU with a master's in creative writing in 1992. While taking a year off from graduate school, Coverly was an art director for a public relations firm, and an editorial cartoonist for the Battle Creek Enquirer. In 1990, he returned to Indiana and became the editorial cartoonist for The Herald-Times in Bloomington. His cartoons were regularly reprinted in such publications as Esquire, Saturday Evening Post, The New York Times, and USA Today. In 1994, Creators Syndicate picked up his untitled cartoon panel, helped choose the name Speed Bump, and a year later it was running in nearly 100 papers. Coverly left The Herald-Times in 1995 to concentrate on his syndicated work. In 1995, and again in 2003, Speed Bump was given the Best Newspaper Panel award by the National Cartoonists Society, an honor for which it was also nominated again in 1997, 2001, and 2002. In 1998, the same organization gave him another award for Best Greeting Cards. 20010 saw the release of Coverly’s first major children’s book, Sue McDonald Had a Book, authored by Jim Tobin, and published by Henry Holt, Inc.; their second book, The Very Inappropriate Word, will be published by Holt in 2012. Coverly’s first solo book project, The Late Bird, will be released in 2013, and his second, 10 Things You Should Never Do During a Soccer Game, is to be published by Holt in 2014. In 2009, Coverly was given the prestigious Reuben Award for Outstanding Cartoonist of the Year, the highest honor awarded by The National Cartoonists Society. More information on the award and its past winners may be found at www.reuben.org. In 2012, Eastern Michigan University asked Coverly to give the spring commencement address, and presented him with an Honorary Doctorate in Fine Arts. Coverly works out of an attic studio in Ann Arbor, Michigan. He is married to Chris, and they have two daughters, Alayna and Simone. His website is www.speedbump.com.